MEMPHIS, Tenn., Nov. 14, 2016 /PRNewswire/ -- Verso Corporation (NYSE: VRS) today reported financial results for the third quarter of 2016. "With our successful restructuring behind us, Verso is moving forward with a comprehensive strategy designed to drive continued improvement in our operating and financial performance," said Allen Campbell, Verso Senior Vice President and Chief Financial Officer. "We remain committed to providing the high quality products and exceptional service our customers have come to expect from us as we strive to improve our safety performance, increase manufacturing efficiency, drive down cost and deliver stronger financial results." 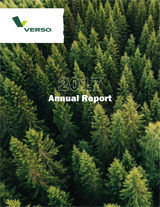 Verso's financial results for the quarter were significantly impacted by fresh-start accounting adjustments, pricing in the market and major maintenance costs incurred in the quarter. Verso Corporation (the "Company") adopted fresh-start reporting as of July 15, 2016 (the "Effective Date"), the effective date of its First Modified Third Amended Joint Plan of Reorganization Under Chapter 11 of the Bankruptcy Code dated as of June 20, 2016 and the date that Verso emerged from its Chapter 11 cases. As a result of the application of fresh-start reporting, the Company's financial statements for periods prior to the Effective Date are not comparable to those for periods subsequent to the Effective Date. References to "Successor" refer to the Company on or after the Effective Date. References to "Predecessor" refer to the Company prior to the Effective Date. Operating results for the Successor and Predecessor periods are not necessarily indicative of the results to be expected for a full fiscal year. References such as the "Company," "we," "our" and "us" refer to Verso Corporation and its consolidated subsidiaries, whether Predecessor and/or Successor, as appropriate. Net sales for the third quarter of 2016 were 14% lower than the third quarter of 2015. Our sales decline was attributable to a 10% decrease in total sales volume and a 4% decrease in pricing due to the general softening of demand for coated papers, our capacity reductions at our Androscoggin mill, and the closure of our Wickliffe mill. Gross margin was down from 13% in the third quarter of 2015 to 5% due to the revaluation of inventory and higher maintenance costs. Maintenance costs were impacted by the change in policy to expense major outages as incurred, partially offset by favorable raw material prices. Depreciation, amortization and depletion for the third quarter of 2016 was 48% lower than the third quarter of 2015, attributable to capacity reductions at our Androscoggin mill, closure of the Wickliffe mill and the reduction in fair value of our property, plant & equipment as a result of adopting fresh-start accounting. Reorganization items, net for the Predecessor period from July 1, 2016 to July 14, 2016 was a net gain of $1,302 million, primarily attributable to adjustments to reflect the non-cash gain associated with the elimination of debt, offset by the non-cash impact of fresh-start accounting and professional fees directly associated with our Chapter 11 cases. Net sales for the first nine months of 2016 were 16% lower than the first nine months of 2015. Our decline in sales was attributable to a 13% decline in total sales volume and a 3% decrease in pricing due to the general softening of demand for coated papers, our capacity reductions at our Androscoggin mill, and the closure of our Wickliffe mill. SG&A expenses decreased by 12% compared to the same period of the prior year, primarily as a result of synergies achieved from the NewPage acquisition. As a percentage of sales, selling, general and administrative expenses were flat year over year. Depreciation, amortization and depletion for the first nine months of 2016 was 31% lower than the same period of the prior year, attributable to capacity reductions at our Androscoggin mill, closure of the Wickliffe mill and the reduction in fair value of our property, plant & equipment as a result of adopting fresh-start accounting. Restructuring charges increased $70 million for the first nine months of 2016 compared to the same period of the prior year. Restructuring charges for the first nine months of 2016 consisted primarily of non-cash fixed asset write-down charges from the closure of the Wickliffe mill. Other operating income for the first nine months of 2016 increased $55 million and was primarily attributable to the sale of hydroelectric facilities in January 2016. Reorganization items, net for the Predecessor period from January 1, 2016 to July 14, 2016 was a net gain of $1,338 million, primarily attributable to adjustments to reflect the non-cash gain associated with the elimination of debt, offset by the non-cash impact of fresh-start accounting and professional fees directly associated with our Chapter 11 cases. Verso's performance in the third quarter, excluding the impact of fresh-start accounting, was driven by negative pricing in the market, significant maintenance spending and poor operational performance in one of our mills on restart from a maintenance outage. These items were partially offset by favorable raw material costs. The operational performance of the mills improved substantially in the last month of the third quarter and is projected to continue improvement in the fourth quarter. Maintenance spending is expected to be $30-35 million less in the fourth quarter than in the third quarter. The Company has announced a price increase in Supercalendered and Coated Groundwood products effective in the fourth quarter along with temporarily idling 200,000 tons of annual capacity at its Androscoggin mill. EBITDA consists of earnings before interest, taxes, depreciation, and amortization. Adjusted EBITDA reflects adjustments to EBITDA to eliminate the impact of certain items that we do not consider to be indicative of our performance. We use EBITDA and Adjusted EBITDA as a way of evaluating our performance relative to that of our peers and to assess compliance with our credit facilities. We believe that Adjusted EBITDA is an operating performance measure commonly used in our industry that provides investors and analysts with a measure of ongoing operating results unaffected by differences in capital structures, capital investment cycles, and ages of related assets among otherwise comparable companies. We believe that the supplemental adjustments applied in calculating Adjusted EBITDA are reasonable and appropriate to provide additional information to investors. Because EBITDA and Adjusted EBITDA are not measurements determined in accordance with accounting principles generally accepted in the United States, or "GAAP," and are susceptible to varying calculations, EBITDA and Adjusted EBITDA, as presented, may not be comparable to similarly titled measures of other companies. You should consider our EBITDA and Adjusted EBITDA in addition to, and not as a substitute for, or superior to, our operating or net income or cash flows from operating activities, which are determined in accordance with GAAP. (1) Net gains associated with the Chapter 11 cases. (2) For 2016, charges are primarily associated with the closure of the Wickliffe mill, of which $137 million is non-cash. For 2015, charges represent severance and employee-related costs and other restructuring charges associated with the NewPage acquisition, the closure of the Bucksport mill and the capacity reductions at the Androscoggin and Wickliffe mills. (3) Non-cash charges related to the one-time impacts of adopting fresh-start accounting. (4) Realized gains on the sale of assets, which are primarily attributable to the sale of hydroelectric facilities in January 2016. (5) Costs incurred in connection with advisory and legal services related to planning for and emerging from the Chapter 11 cases. (6) Professional fees and other charges and integration costs incurred in connection with the NewPage acquisition, including one-time impacts of purchase accounting. (7) Amortization of non-cash incentive compensation, unrealized losses (gains) on energy-related derivative contracts, Wickliffe operating costs while idled, and miscellaneous other non-recurring adjustments. In this press release, all statements that are not purely historical facts are forward-looking statements within the meaning of Section 27A of the Securities Act of 1933 and Section 21E of the Securities Exchange Act of 1934, including our expectations for sales in the third quarter of this year and capital expenditures for the remainder of the year. Forward-looking statements may be identified by the words "believe," "expect," "anticipate," "project," "plan," "estimate," "intend," "potential" and other similar expressions. Forward-looking statements are based on currently available business, economic, financial, and other information and reflect management's current beliefs, expectations, and views with respect to future developments and their potential effects on Verso. Actual results could vary materially depending on risks and uncertainties that may affect Verso and its business. Verso's actual actions and results may differ materially from what is expressed or implied by these statements due to a variety of factors, including those risks and uncertainties listed from time to time in Verso's filings with the Securities and Exchange Commission. Verso assumes no obligation to update any forward-looking statement made in this press release to reflect subsequent events or circumstances or actual outcomes. Verso will host a conference call on Monday, November 14, 2016 at 3 p.m. (EST) to discuss third quarter 2016 results. Analysts and investors may access the live conference call only by dialing 888-317-6003 (U.S. toll-free), 866-284-3684 (Canada toll-free) or 412-317-6061 (international) and referencing elite entry number 0727944 and Verso Corporation. To register, please dial in 10 minutes before the conference call begins. The conference call and presentation materials can be accessed through Verso's website at http://investor.versoco.com/ by navigating to the Financial Information page. This release and Verso's quarterly report on Form 10-Q for the period ended September 30, 2016, will be made available on Verso's website at http://investor.versoco.com/ by navigating to the Financial Information page. A telephonic replay of the call can be accessed at 877-344-7529 (U.S. toll-free), 855-669-9658 (Canada toll-free) or 412-317-0088 (international), access code 10096014. The replay will be available starting at 5 p.m. (EST) Monday, November 14, 2016, and will remain available until December 14, 2016. An archive of the conference call and webcast will be available at http://www.versoco.com/ starting at 5 p.m. (EST) Monday, November 14, 2016, and will remain available for 120 days.